Recently I popped the corks on nearly $2000 worth of Napa Cabernet, planning just to drink a couple glasses of the ones I liked best. I ended up writing my column this month for Wine Review Online about one of my two favorites, Chappellet Signature Napa Valley Cabernet Sauvignon 2009, which at $49 was the cheapest bottle I opened. I mentioned but didn't go into details about my other favorite: Au Sommet Atlas Peak Cabernet Sauvignon 2009 ($250). But I don't want to give short shrift to the Au Sommet, which is a delicious wine and an interesting project as well. Atlas Peak has been a rare problem area of Napa Valley, marketing-wise, for years. It certainly looks like you can grow great wine there; the Antinori family, who grow great wines in Italy, chose it as their outpost in California after a statewide search and paid a then-record $11 million for a vineyard there in 1986. At the time, Atlas Peak had only 30 acres planted; mountain vineyards were still seen as more trouble than they were worth. And it wasn't even designated as an AVA. Atlas Peak reminded Marchese Piero Antinori of his native Tuscany, so he made a viticultural and marketing error, planting Sangiovese in Cabernet country. The flop was epic, bringing down the reputation of Sangiovese in America (as with Chardonnay and Burgundy, some U.S. wine drinkers would say they liked Chianti Classico but not Sangiovese) and giving Atlas Peak a black mark against its name just when wine prices were skyrocketing in the 1990s. Atlas Peak has not yet really recovered from the image problem. The other hills of note in Napa Valley all seem to fetch a greater premium: Howell Mountain, Diamond Mountain, Mt. Veeder, Spring Mountain. Antinori himself has switched to Cabernet and makes the well-respected Antica from Atlas Peak. But Atlas Peak still doesn't seem to excite the Cabernet crowd the way Oakville or Rutherford do -- yet given the topography, it really should. If there's anyone who knows about making great wine in Napa Valley -- and selling it for a premium -- it's the team of Heidi Peterson Barrett and John Schwartz. Barrett has the winemaking chops, honed at Screaming Eagle, Grace Family and others, and Schwartz understands the luxury Cab consumer. Not everyone is willing to spend $250 on a bottle of Cab for a Tuesday night dinner at a steakhouse, so it really is worthwhile figuring out what pushes the buttons of those who will. In many cases, assuming the wine is good enough, it's as simple as bottle design and packaging. Au Sommet is a departure for the Barrett/Schwartz team style-wise. The label looks academic, with "ELEV 2000 FT" in larger letters than anything else but the brand name. They're not trying to hide the fact that they're selling a $250 wine from their 7-acre vineyard on Atlas Peak; they're trying to justify it. Robert Parker only gave the '09 Au Sommet a 94, which is good news and bad. Personally I like Parker's 90-95 point wines more than those in the high-90s, and I wonder how many others have come to this realization. You probably don't want a Napa Cab that Parker rated in the 80s, at least not to drink now, but the ones he rated in the high 90s tend to be the monolithic fruit bombs that his detractors slam him for. He's a good enough judge of character to admire well-made non-fruit bombs with scores like this. In fact, for me, a 94 for a Napa Cab from Parker is just about the best possible score in terms of predicting whether or not I'll like it. Please note that I didn't look up the scores before tasting, but I had a chuckle in seeing that 94 after I'd enjoyed 2 1/2 glasses of Au Sommet. What I like about this wine is that, while it has the concentration that you expect from a $250 Cabernet -- come on, nobody pays that much money for a lean and funky cool-climate Syrah -- it has good balance as well. It tastes like mountain fruit, with the deep cherry fruit you expect, nice milk chocolate notes, and a hint of fresh herb that keeps it interesting. There are plenty of tannins but they're well-managed, so this is a smooth drinking experience. There's 2% Petit Verdot in the blend, which probably adds to that textural richness. Plenty of $250 Cabernets taste fantastic when you take 1 or 2 sips to rate them but tire the palate after one glass. The only reasons I stopped drinking this were because I was also enjoying the Chappellet, and 4 1/2 glasses of Napa Cab between the two was more than I planned to drink when I started. Plus I had been tasting just before drinking. But this wine on its own is a restrained 14.3% alcohol, so two people could easily finish it and not cry over spilt Cabernet. I have some regret that I opened it this year and won't know how well it will taste in five years. But it was tasty when I did drink it, so I wouldn't worry about robbing the cradle. Is it worth $250? As John Schwartz could tell you, if you have to ask that question, the answer for you is probably no. Every day scores of people spend $250 extra to have a nicer hotel room. It's all a matter of your budget and priorities. If $250 is a little rich for you, read the Wine Review Online column about the $49 wine here. And if you think, "Ah, that's nothing," please consider tossing a little something in my virtual tip jar. I take Visa, Mastercard, American Express and that ghetto card that started out at Sears. 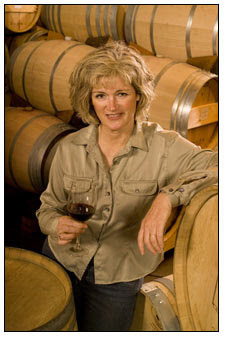 Can you recommend any other Atlas Peak wines? Very good question! I cannot. That doesn't mean they don't exist. I haven't done a major tasting of Atlas Peak wines in about 6 years, and when I did, I must report that I was not impressed. But 6 years is a long time.